It’s time to take the pink Barbie glasses off, quit the rainbow unicorn memes and positive thinking and see humans for what they really are – selfish, scared and stupid. As someone who formally studied marketing and has informally studied human behaviour for two decades, I can vouch for the fact that a book exploring both subjects in an intelligent and practical way is as rare as a copywriter who doesn’t love a good comparative metaphor (see what I did there?). Dan Gregory and Kieren Flanagan are two of the brightest strategic minds in advertising and marketing. They’re razor sharp, funny and together they’ve penned a powerful manifesto for anyone who wants to have real influence and achieve real results through understanding why humans do what they do and what underlying drivers impact and predict human behaviour. 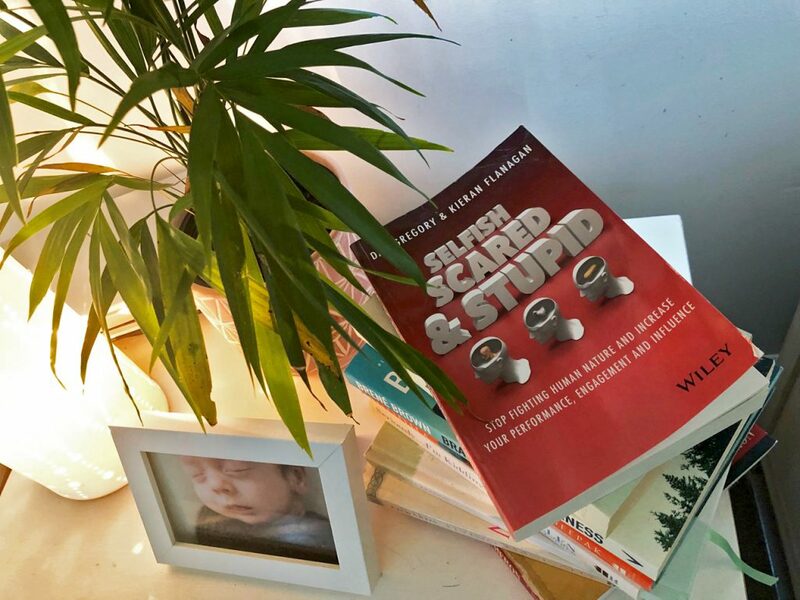 Selfish, Scared and Stupid is not merely a controversial title to hook you in. It challenges everything you think you know about what really drives us all. You soon realise that the harsh reality is that we are all selfish, scared and stupid. And as offensive as that may sound to some, Dan and Kieren invite us to accept, applaud and leverage these qualities. As they argue, being selfish, scared and stupid has enabled the human race to survive and evolve. It’s an in-depth and insightful slant on the traditional ‘WIIFM – What’s In It For Me?’ principle anyone in sales, marketing or advertising has been exposed to, complete with a practical set of principles for applying WIIFM, including linking your success to the success of those who you wish to influence and demonstrating how you serve communities and networks as well as the individuals in them (in other words, link your action to a broader cause). When posing strategies for ‘thinking scared’ , this book outlines possibly the most potent aspect of human behaviour — that fear drives change — and outlines tips, tricks and tactics for ‘flipping the fear’ and using fear for action rather than inaction. Understanding what people are scared of and why is the pre-curser to real influence. Thinking stupid is about understanding that humans are lazy and are wired for the taking the path of least resistance. When we make things simple, easy and hard not to do by removing barriers to action, you remove confusion and inspire action. (In a post-digital world of information overload, the make-it-simple shortcuts in chapter 10 were the gold in this book for me). The book then outlines a three-phase, 9-step model for thinking selfish, scared and stupid and how to apply it. The ‘combination lock’ as Dan and Kieren call it give you a blueprint for leveraging the innate self-interest, fear and laziness that is woven through human DNA. Once your perspective is given this jolt around what it means to be selfish, scared and stupid and you accept that these are the undeniable guiding principles of human behaviour, the possibilities for how to amplify your influence and impact on the world around you emerge. Dan and Kieren invite you to engage your intrinsic natures rather than fight them, with a set of practical principles that can be applied across all areas of business and life. For most small businesses, the most valuable assets in the organization walk out the door every day at 5pm. The value of the business, therefore, does not lie in the business itself, but largely left to the success of hiring policies – or to luck. The greatest step – change a small business can make it when the value of the intellectual property of the business – the proprietary processes, systems, brand guidelines and ‘nowhere else experiences’ – is independent of those who choose to work in its employ. For selfish, scared and stupid leaders. It has become cliché to assert that there is a difference between leaders and managers; what is rare, though, is clarity about what informs this distinction. Perhaps a helpful definition is simply that managers are appointed, whereas leaders… well… lead. One therefore gains authority from position; the other gathers followers. In other words, what makes a great leader is not that they tell you what to do but that they help you realize what you could be. In doing so, they build a culture of the willing, the voluntary and the enthusiastic. Leaders build environments and belief systems that inform our ‘who, what, why’, whereas managers inform the ‘how’. A selfish scared and stupid leader brings a measure of both – that is, an ability to demonstrate how their vision aligns with our goals, to give us the courage we need and to set a simple path for us to follow. They also engineer an environment that enables us to be motivated, supported, efficient and competent. The sale is virtually never in the product, it is always in the prospect. The less you talk about yourself, your product, its features and its benefits instead anchor yourself in your customer’s identity – their self-interest – understand their fears and shift them from inaction to action while removing unnecessary friction and complication, the more charismatic, influential and persuasive you become. This book is an honest and witty observation on the best and worst of human nature and how you can embrace the truth to impact behavioural change. As Dan and Kieren so eloquently point out – we’re all selfish, scared and stupid … thank goodness. You can buy a copy of Selfish, Scared and Stupid by Dan Gregory and Kieren Flanagan here.